Everybody has heard of Gazpacho, but you might not of heard of Okroshka with Kefir. It’s a summer soup, jam packed with vegetables, that is served cold. Trust me, it’s perfect for a hot summer day. Like many Russian foods, it might be an aquired taste. I remember when we thought that Sushi was exotic, now it’s a staple in my kid’s diets. Okroshka is derived from the Russian word literally meaning “chop” крошить, which is why it’s chopped up in small pieces. I have no idea why Russians love chopping their food into tiny pieces, I mean, who has all that time? I bought a Zyliss Onion Chopper, which works beautifully for all my fast chopping (cubing) needs. There are many ways to make Okroshka from a soup base perspective, but the vegetables always are kind of the same. The 2 more popular Okroshkas are made with Kefir or with Kvass, giving a totally different soup flavour. 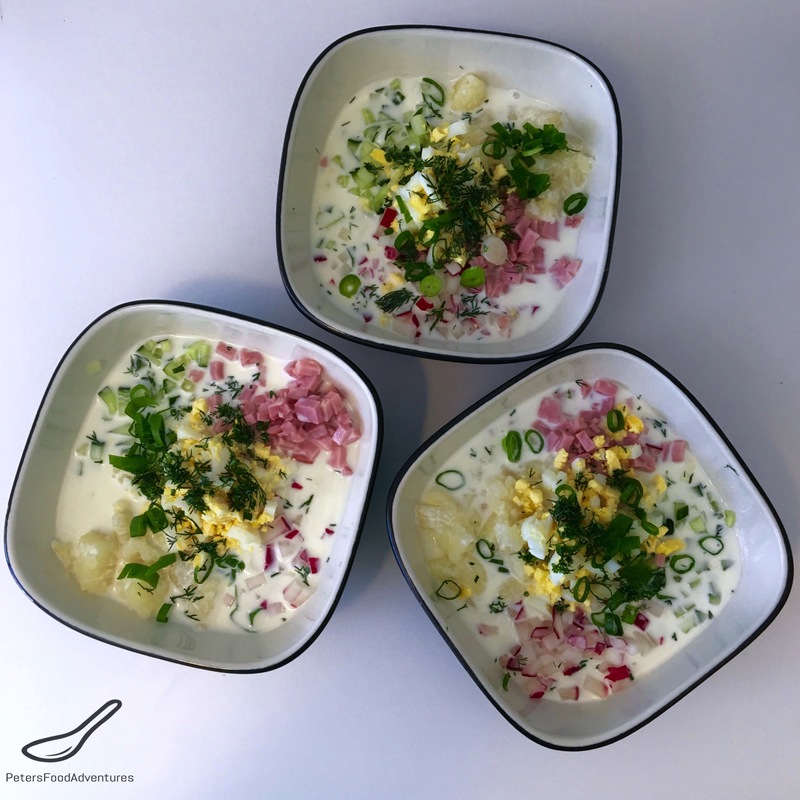 I’ve made Okroshka with Kvas also, but this Kefir soup recipe is one of my favourites. Kefir is incredibly healthy for you and can be found in some supermarkets here in Australia, and even more popular in the States. Svekolnik is another popular cold Russian borscht soup popular in the summer! Kefir is a fermented milk drink, made with Kefir grains, which is full of probiotics. Since this soup is served cold, all the health benefits remain alive in the soup. It’s similar in ingredients and chopping process as the famous Russian salad Olivye. It’s almost like a runny salad in a bowl, not a soup! Eating Okroshka Soup on a hot summer day is not only filling, but is a delicious way to cool down. Bon Appetit! Приятного аппетита! Hardboil the eggs. Cook the potatoes until cooked, but not mushy and overcooked. Peel and cut into small cubes. Cool the eggs and chop finely, or slice in half lengthways for a nice visual effect when serving. Potatoes and eggs must be cold before serving. Slice the green onions and dill and set aside for when you are garnishing. Place eggs, potatoes, ham, cucumber, radishes and salt in a large pot (or individual bowls). Add the chilled Kefir and stir together. It's best if your refrigerate for a few hours to allow the soup to get really cold and the flavours to meld together. If you don't have time to chill, then you can serve with a few ice cubes. Serving with a dollop of sour cream, dill and green onions. * If you can't find Kefir, then substitute with 3/4 cup natural Greek yogurt and 1/4 cup milk. Wow ! this sounds interesting Peter…. pinned 🙂 . I will be making this, I love trying new things. Thanks Lynne! Definitely a great summer soup, perfect after a visit to a Farmer’s Market! Looks like a very enticing dish! Thanks! You can’t go wrong with all the veggies!!! I have long wanted to make this. Your food styling is beautiful. Thanks so much for the compliment, hope you enjoy it! ???? Interesting. Not sure about a cold soup. I’m in agreement that I’d have to acquire the taste. Looks awesome! Definitely haven’t heard of this. I’ll have to try it in the summer. There are a few versions of this, all very different, I’ll post more soon. This is the summer of cold soup for me! ???? Now I can see You have Summer down there. The recipe is great as all Russian recipes. I make a similar soup called Chłodnik in Polish, but mine is much simpler or maybe I just adapted it to be simple. Thanks Anna! Yes, I know the soup, we call it Holodnik, I’m making it next week! It was 39 degrees today, too hot for hot food! Your soup looks fantastic! Love Eastern European food, so many variations in our food! ??? ?